Hint: Do you yourself wish to become a Good angel? Just click on the button below and start helping families! A “Give Angelship” voucher works primarily as a gift for your loved ones. Thank you! 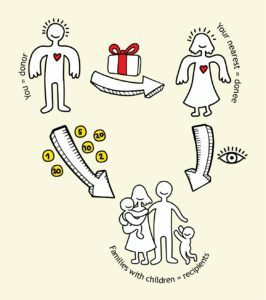 In the form below, a donor generates a Good angelship gift voucher for a donee and sets a standing order to pay the donation. Using the unique Angel number and Password printed on the voucher, the donee can then sign in to their Angel profile, where they can see the gift. Thanks to Good angelship, the recipient has the same rights as any other Good angel, and can view the life stories of the families whom they are helping, and can even check that the payments have been distributed to the recipients. Naturally, these contributions are also distributed to families down to the last cent. All you need to do is fill out this short form, generate and print out a gift voucher, set the payment of your choice, and here comes a unique gift. It only takes an instant, without the need to go anywhere or to wait for the payment to be credited to the Good angels.